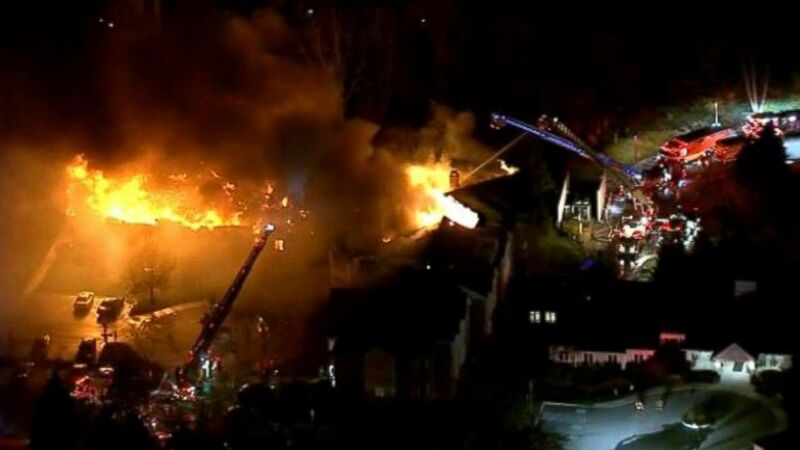 WEST CHESTER, Pa. -- At least 20 people have been injured in a massive, multi-alarm fire at a senior living community in West Chester. Numerous residents have been displaced. Fire officials have refused to say if there were any fatalities. The blaze was reported at 10:46 p.m. Thursday at the Barclay Friends Senior Living Community on the 700 block of North Franklin Street. The fire quickly spread to multiple buildings and flames could be seen shooting from the roofs and windows of the structures. Residents were forced to evacuate outside into the cold, with temperatures overnight hovering in the low 40s. Watch Action Cam video from the scene of a major fire at the Barclay Friends Senior Living Community. Officials said the inferno went to five alarms before it was declared under control at 1:22 a.m. Friday. Video from Chopper 6 and the Action Cam showed dozens of residents on the lawn or along the street, wrapped in blankets. Many of them had been pushed in wheelchairs or rolled on beds to safety. Fire at West Chester senior community: Katherine Scott and Jeannette Reyes report during Action News at 4:30 a.m. on November 17, 2017. At a news conference shortly before 6:30 a.m. Friday, officials declined to say how many residents were injured, or if there were any fatalities. But earlier in the morning, Chester County emergency officials said at least 20 people were taken to area hospitals for treatment. Watch Action Cam video of ambulances arriving at Paoli Hospital after a major fire at at West Chester senior community. Action News is told nine people were taken to Chester County Hospital. Seven were taken to Paoli Memorial Hospital. There was no immediate word on the conditions of the injured. A spokeswoman for Main Line Health said one of its hospitals also was prepared to provide shelter to some additional residents of the senior living community. According to its website, Barclay Friends offers various levels of care including memory care, skilled nursing, and post-acute rehab. Early Friday morning, the local chapter of the American Red Cross said on Twitter that it had multiple teams on the scene and that it was working with county officials and facility staff to assist displaced residents. A cause of the fire remained under investigation.